Thinking of buying or renting a bigger space? When considering buying (or renting) a new bigger house, people usually mistakenly think only about an increase in their monthly mortgage payments. There are plenty mortgage payments calculators on the market that will give you accurate estimates of your new monthly mortgage payments. However, I went a couple of steps further and provided tool to calculate a change in your new house utilities and maintenance costs that will unmistakably change along with mortgage payments. These costs seem little but will add up and dip in your monthly budget. They had to be considered. There are two easy steps to follow. In the step one, you will input your current cost for items on the list in the analysis such as. - Current Total Square footage. In the step two, you will be asked to provide information of what your plans are related to new house. You are done. 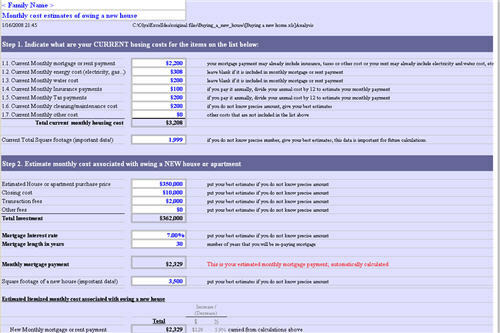 New costs associated with owing or renting a new house will be calculated for you based on rations and usage statistic. References to usage statistics factors are provided.